Ship Shape Elementary: The 100th Day! This week we celebrated our 100th day of school! The simple but fun activities we did turned out to be the perfect way to celebrate this exciting milestone. Before the big day I sent home a piece of card stock with a note asking each student to prepare a display of 100 items. These are always so creative and cute and I love hanging them up in the hall to share. As we do each year, my team sent home this letter from Deanna Jump and asked our first graders to dress up like they are 100 years old. They were darling! 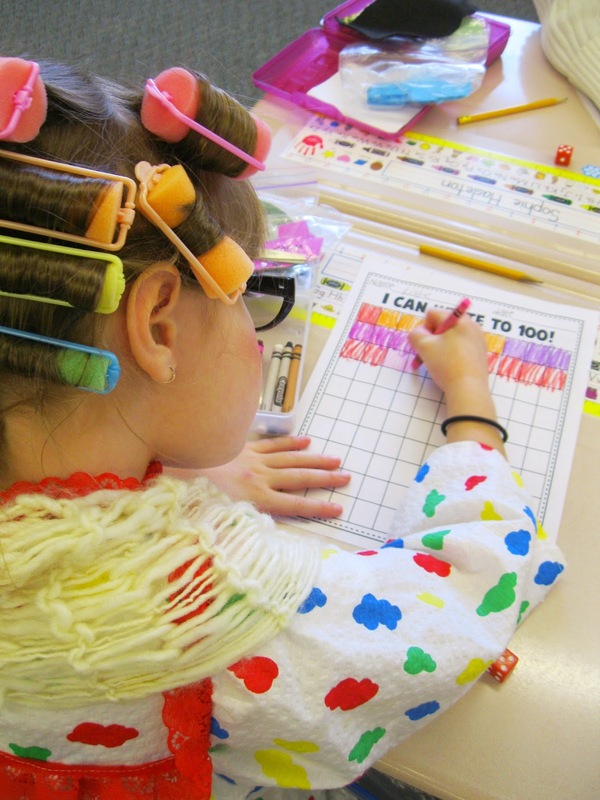 I especially loved this little gal who came in a mu-mu and curlers! 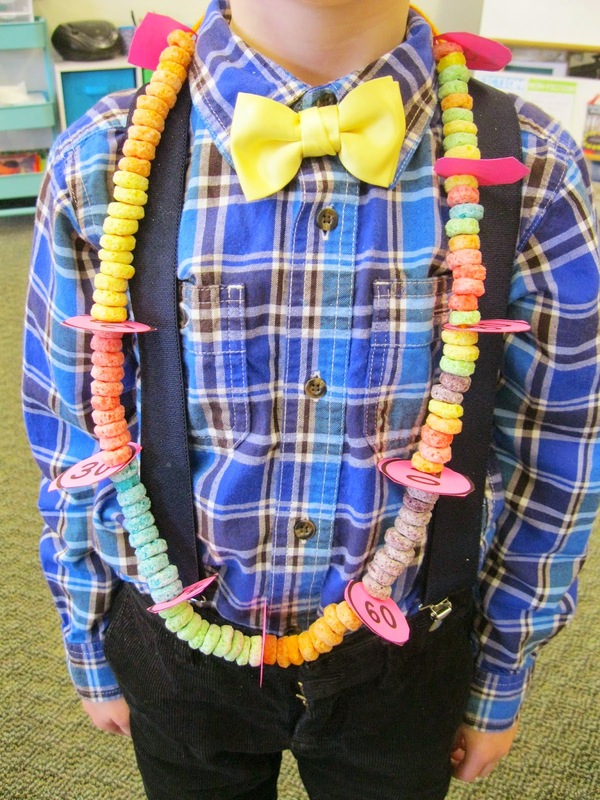 We did some of the fun activities in this free pack from Mrs. Jones' Creation Station and then we began making our annual Fruit Loop necklaces. We used this tens sorting mat (here) and I had my kids cut out little "10 checkpoints" to mark sections of ten on their necklaces. You can grab those for free here. These necklaces are always a hit! And they look especially cute on first graders dressed up to look much older than they are! In the afternoon we did seven quick center rotations. These went over famously! I used this packet from Cara Carroll for a few of the center ideas. We wrote 100 words...actually we were able to write many more than 100 so this chart paper ended up looking like first grade graffiti! I put little garage sale label stickers on Starbursts and numbered them to 100. I mixed them up in a bowl and had my kids sort them out on a Hundreds poster. They loved this activity! We built cup structures out of 100 cups! My kids were very creative with this! This was probably the most highly anticipated of the centers! Their little teams of four worked together to complete 100 exercises and check them off as they went. After all the centers we sat down to enjoy our 100th Day trail mix. Everyone brought a bag of 100 small snack items and we mixed them all together. I know it looks disgusting (I think the Cheetos are to blame), but my kids sure enjoyed it! And that was that! Overall it was a wonderful day celebrating all that we have accomplished in first grade thus far. Here's to 80 more days of learning! To check out last year's 100th Day click here. Where did you get the 100 day pennants with the student names? Do you have a template for it? They are soo cute! Our Week of Studying with Dr. Seuss! Go Math and a Freebie 120 Chart! Management, Crayons, and some Freebies!